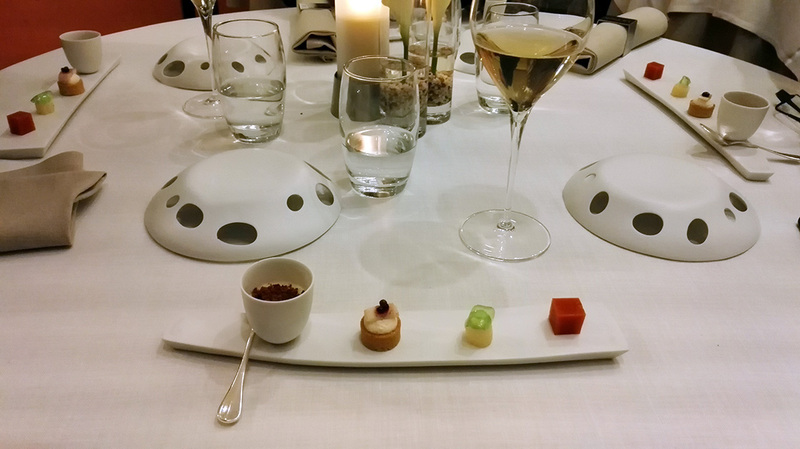 Appetisers with champagne @ Le Foch, Reims, January 2018. It’s been over 25 years since I bought my first scruffy book about herbs in a dusty second-hand bookstore in my hometown Ghent, and I had no idea it would eventually lead me to a passion for champagne. Yet this simple purchase is what started it all: it gave me a first glimpse through the keyhole of a secret garden brimming with scents and flavours – a journey that could only land in the magical world of food and wine. 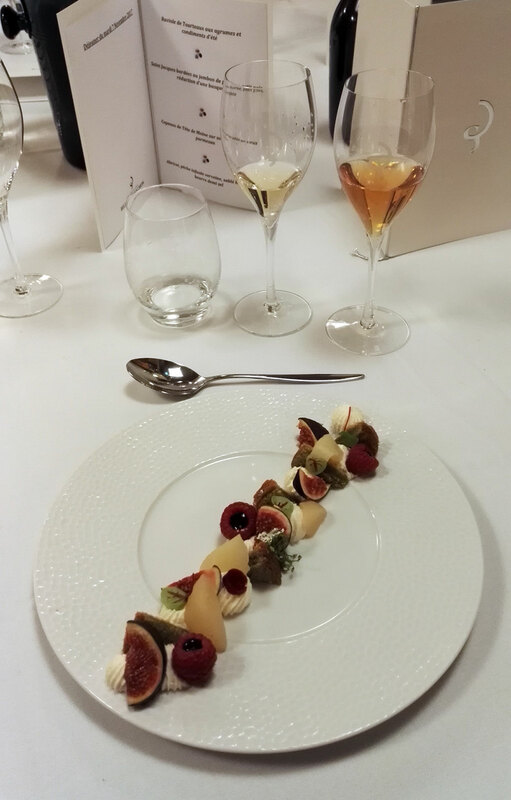 Champagne and cheese pairing @ Billecart-Salmon, November 2017.
and don’t underestimate the versatility of champagne wines to accompany vegetarian and vegan dishes, with which a full-bodied red wine’s tannins often feel too astringent. Now, how to choose the right champagne with your meal? Some basic understanding of wine aromas can help you there, even more so because adding the right herbs, spices and other aromatic ingredients to your dish, adapts it even better to a specific wine. Apple blossoms. Photo (c) Dirk De Kegel. In young, fresh and fruity champagnes for instance, the dominant aromas tend to be fruit, flowers or fresh herbs. These wines go well with shellfish and other refined seafood dishes, in which grated lemon zest, dill, mint, lemon juice or ginger can build additional aroma bridges between food and wine. Or make a crisp green herb salad, to which you add apple or pear slices, edible flowers, citrus fruit segments or even olives. Champagnes that have a more exuberant and exotic fruit profile tend to complement lightly-spiced Asian-style salads, touched up with lychee or pineapple. Walnuts. Photo (c) Dirk De Kegel. More mature champagnes on the other hand, which remained ‘sur lattes’ for a longer period, display a rounder, creamier mouthfeel and additional aromatic complexity. The extended contact between the wine and its lees – the dead yeast cells that slowly break down under the influence of enzymes in the wine – gives rise to new aromas and flavours, i.a. nuts, pastry, candied fruits, bread dough and toast. These champagnes match well with richer, savoury and lightly (tea- or hay-)smoked foods, butter-baked seafood, poultry or pork, and with sotolon-based flavours like parmesan cheese, maple-cured pork, nuts, sesame oil, lovage, fenugreek and curry. Look for vintage champagnes (these need to age at least three years), calculate from the disgorgement date on the label (if mentioned), or ask the producer how long the wine spent ‘sur lattes’. Cloves. Photo (c) Dirk De Kegel. Champagnes composed with oaked base wines or barrel-aged reserve wines tend to be spicier, showing notes of cloves, nutmeg, vanilla, smoke, coffee or cinnamon. These pair well with pan-fried fish or char-grilled meat, mushrooms or roasted root vegetables. They’re also a good match for butter-basted roast chicken, grilled cheese dishes and for the spice-rich cuisines of South America, Southern Asia and the Middle East, using warmly fragrant ingredients like coriander, cumin, cloves and cinnamon. For additional aroma correspondence, garnish with a drizzle of toasted nut oils, such as sesame or hazelnut. The suggestions above are just a few examples to illustrate the versatility of champagne wines as food partners. For more inspiration… stay tuned, or ask away in the comments!